GLOUCESTER EMERGENCY ALERTS powered by Smart911 is the official emergency notification system used by the City of Gloucester to communicate with residents during emergencies. Sign up now to receive free alerts from the City via text message, email, voice message, or social media. Emergency Notifications - Urgent, must-know information that may require action such as taking shelter. Alerts may include water advisories, road closures, power outages, evacuations, lock down situations, etc. Advisories - Important need-to-know information but not necessarily immediately time-sensitive. Alerts may include missing person alert, amber alert, prescribed burn notices, etc. Traffic Alerts - Time-sensitive situations affecting the flow of traffic and creating an immediate hazard on major thoroughfares or at the request of FIRE/EMS/LAW personnel at the scene. ~ General ~ What is Gloucester Emergency Alerts powered by Smart911? Gloucester Emergency Alerts powered by Smart911 is Gloucester’s official emergency alert and notification system. This system is used to send alerts to the public during emergencies. Gloucester Emergency Alerts powered by Smart911 is a free service that allows you to sign up online to receive customized alerts via text message, email, and voice message. In addition to emergency alerts, you can also choose to receive customizable community notifications. These include notifications about severe weather, safety, health, utility disruptions, major traffic incidents, and more. This service is provided by the city at no cost to the public; however, message and data rates may apply. Why should I sign-up for Gloucester Emergency Alerts powered by Smart911? When emergencies happen, be the first to know. The Gloucester Fire and Police Departments use Gloucester Emergency Alerts powered by Smart911 to send official real-time alerts to the public with information about potentially life-saving actions they may need to take to keep themselves and their families safe. By signing up for Gloucester Emergency Alerts powered by Smart911, you are taking a large step toward improving your personal safety. How does it work? When an emergency occurs that meets the criteria for sending out an alert to the public, the Gloucester Emergency dispatchers will gather the necessary information and push out an alert to the affected area. Alerts can be sent out city-wide to everyone who has opted-in to the system, or to a specific area or neighborhood for more localized events. How much does it cost? This service is provided by the City at no cost to the public; however, message and data rates may apply depending on your provider and phone services. Can you guarantee that I will receive notifications if I register? Although Gloucester Emergency Alerts powered by Smart911 is an excellent system, we cannot guarantee that you will receive notification in all cases. Disasters and emergencies are chaotic and unpredictable, and notification is dependent on external providers such as your wireless carrier or email delivery service outside the city’s control. Gloucester Emergency Alerts powered by Smart911 will use several means of communications to try to ensure that should any one communications method, technology, or delivery option be unavailable to reach residents, other methods will be used to improve the likelihood that citizens will see the message. How do I sign up for Gloucester Emergency Alerts powered by Smart911? Signing up for Gloucester Emergency Alerts powered by Smart911 is easy! Go to alerts.smart911.com and register your contact information. Who can sign up for Gloucester Emergency Alerts powered by Smart911? Gloucester Emergency Alerts powered by Smart911 is available to anyone who lives, works, travels through, or visits Gloucester. The address can be your home location, work location, or any other location you care about. Will I receive alerts if I do not sign up? Gloucester residents who have a landline phone may receive alerts. However, there are strict rules governing when officials can use this contact information to send out an alert. Only extremely critical alerts containing potentially life-saving information will be sent to landlines. In order to ensure that you are able to get all emergency alerts, we recommend that you sign-up for Gloucester Emergency Alerts powered by Smart911 online. If you do not sign up and register your contact information, you will not receive alerts on your preferred devices and may miss out on receiving important safety information. I do not own a computer – who can help me sign-up for Gloucester Emergency Alerts powered by Smart911? 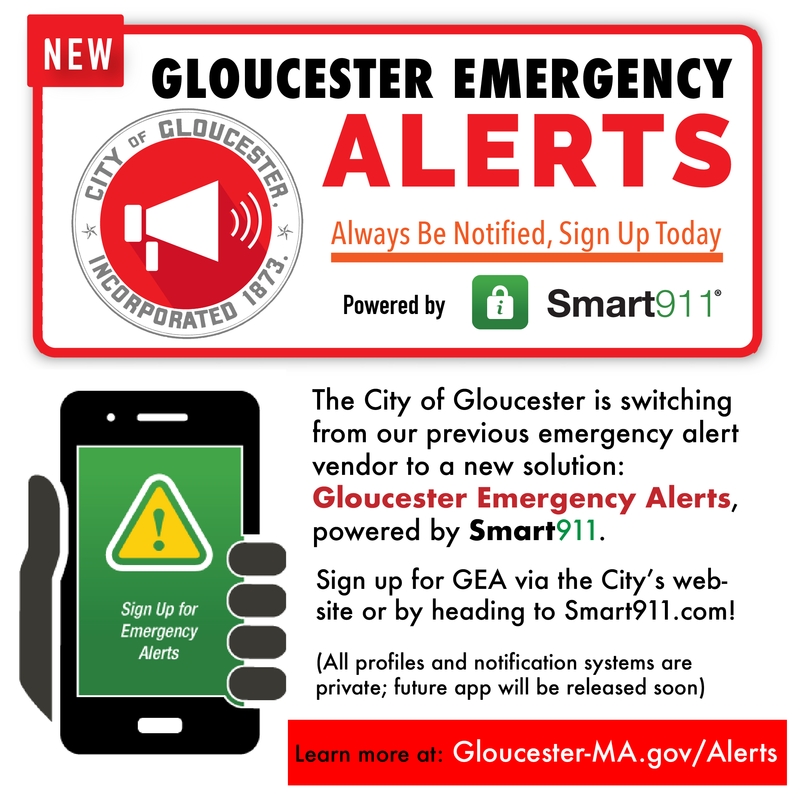 You can visit your local library, Senior Center or the Mayor’s Office to sign up online for Gloucester Emergency Alerts powered by Smart911. Can I call the alert phone number back or reply back to the email? You are not able to reply to texts or emails sent by Gloucester Emergency Alerts powered by Smart911. Voice messages do, however, provide a dial-back number to replay an alert message. When will I start receiving alerts? Once you have signed up online at alerts.smart911.com and confirmed your contact information within the system, you will begin receiving alerts. For example, if you wish to turn off all messages regarding Transportation Disruptions, simply uncheck the box to the left of "Transportation Disruption"
How often will I receive alerts? The frequency for which you receive alerts depends on the addresses you provide and the types of alerts you select to receive as well as the frequency of actual emergencies. Emergency alerts will only be sent when there is an immediate threat to life and/or property. Community notifications will be sent when the criteria for sending an alert are met. This system is not intended to bombard you with information. The City will only send you alerts about the information you select to receive. To change your alert settings, log in to alerts.smart911.com and edit your preferences. How does Gloucester Emergency Alerts powered by Smart911 system respond to busy signals or no-answer situations? If a call completes and is sent to your answering machine or voice mail system, a message is left. If a phone call is not answered or busy, the system redials your number several times. No, information is private and will not be used or distributed in any manner. The information that you provide is exempt from public disclosure and will be used for emergency purposes only. What precautions are taken to protect personal contact information stored in the Gloucester Emergency Alerts powered by Smart911? Personal information provided to Gloucester Emergency Alerts powered by Smart911 is private and only used to notify you for official Gloucester communications and to support the City’s emergency services. Your information is not used for marketing purposes and will not be sold to telemarketers or data-mining organizations. A variety of 'opt-in' mechanisms are available to ensure you are getting only the messages you want to receive delivered via the devices and communications modes that you choose. Gloucester Emergency Alerts powered by Smart911 utilizes the highest standards in physical and computer security technologies and conducts regular audits to ensure that all information is kept secure. Privacy policies are also outlined in the Terms and Conditions you review when you sign up to receive Gloucester Emergency Alerts powered by Smart911 notifications.